Today is Market day in Totnes and the town is buzzing. In the shop people are making a b line straight to the pocket money toys for one reason only. We sell so many stocking fillers that I get a real insight into what Santa is bringing lots of little boys and girls this year. It seems there is a different tradition in every house. When I was little we used lie our pillow cases out by the fireplace in the front room along with a mince pie, glass of milk and a carrot for the reindeer. Until my Dad suggested Santa would much prefer a glass of whisky. We would then sneak down as earlier as possible to get stuck into our present stuffed pillow cases. Often we would get sent back to bed and told it was far to early to start unwrapping presents. There was no sleep going on in that bedroom though, just two excited girls waiting until it was time to go down stairs. When it was eventually my Mum's idea of morning we would tear into our stockings (pillow cases) as she watched our happy child like glee. The presents under the tree would be left until after breakfast when everyone was awake and we would be handed them one each at a time. Lots of people do seem to use pillow cases or a specific Santa's sack but some people have a traditional stocking sized stocking. 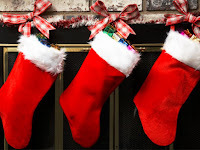 Although many people still hang them by the fire place not everyone has one nowadays so the stocking is put under the tree or hung on the end of the bed instead. The size of the gifts also seems to vary from lots of small things to a few bigger things. With lots of children getting really expensive gifts like iphones and games consols it's no wonder that there other gifts are quite small. The tradition of my childhood Christmases will be carried on into my house and Blake will be helping me make mince pies tomorrow which we will leave out along with perhaps a glass of Baileys for Santa. We have a log burner but Santa always manages to squeeze down it none the less and placed neatly in front of it tomorrow night will be Blake's pillow case.